Why you should keep pigs instead of goats. Personally i don’t like pigs but when it comes down to agribusiness they are my ‘first love’. They offer much in terms of management and production as compared to goats. Pigs maybe be dirty but they are high income generators. Over all I lean more toward pigs when it comes to modern farming. They take more work but they provide a disproportionately larger pay off than goats. I did a little comparison between goats and pigs from the point of view of a modern farmer.Based on it,pig farming came on top. Lets start with the goats, Goats are herbivorous ruminants (plant eaters who chew their cud) who can and will eat nearly anything that they can get to. If you have a good large pasture of mixed plants a small herd of goats will clear it in just a few days or weeks. The goats will eat everything and turn your bushes into desert. In fact in some parts of Africa goats are referred to as ‘Desert Makers’ because they will eat and kill all plant life in the immediate area. They will not only eat grasses and bushes but they will chew the bark off of adult trees and kill the trees, if confined in too small a space goats are very destructive. Goats do need a good variety of plants to eat to maintain a healthy diet, most goat breeds will not do well on just grass, they need shrubs, bushes and trees to eat as well. Pigs are true omnivores, they will eat veg, meat and unlike humans, grasses. They are easy to feed as they will eat nearly anything and much of human history has been fueled by the eating of pork fed off of the cast of food of people. Pigs can be destructive but unlike goats they will not eat everything they will just “play” with it, until it breaks so keep your pigs penned up. 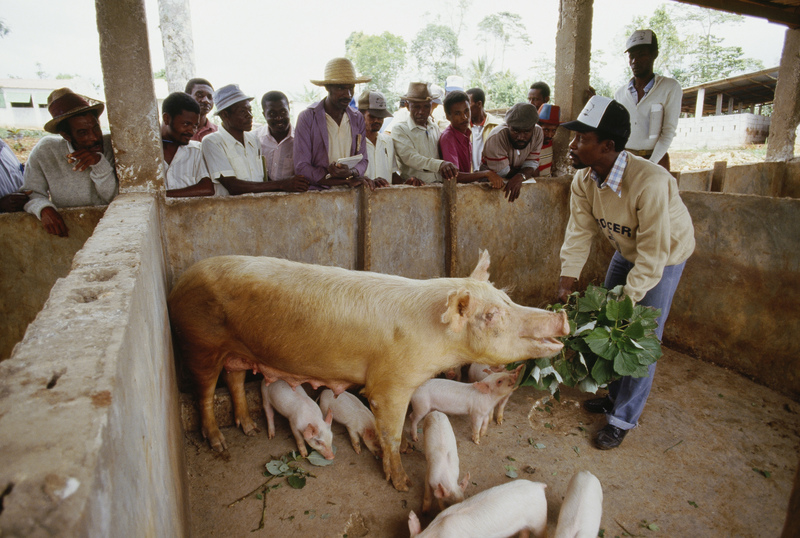 Pigs require less space than a goat and will produce more meat with less food than a goat. They also will get much bigger than any goat and this is something to keep in mind for slaughtering, a big goat may weigh 50 kg where as a big pig can weigh up to 350kg. Pigs also breed faster than goats and this can be very important if you plan on providing all your own food. Pig can give a littler of 10-20 piglets twice a year, where as a goat will give birth up to two kids once a year. If you are thinking about a pig or two let me give you a few pointers. If you can choose between a pure bred pig and a mutton go with the mutton every time. Muttons will be cheaper and easier to raise, pure breeds tend to be too inbred and loose some of their health and vitality through poor genetics. Also avoid any pig that is light colored, pigs can get awful sunburns if they have white or pink skin so stick to blacks or browns ones. This sounds silly but be nice to your pig. Socializing your pigs from a young age will make them more friendly and safer to be around. Previous articleTop Naivasha Flower Farm Announces Scholarships and Job Plans For Students.